In addition to optimizing energy savings and monitoring over two million data points, Microsoft”s Darrell Smith predicted a Seahawks super bowl win six months before the Super Bowl Darrell was right about the Seahawks and is “right on” about how to use data to make buildings smarter and greener. Darrell was kind enough to share how he uses data to make the Microsoft campus one of the most energy efficient complexes on the planet. Thanks to Alper Uzmezler for showing us his cool graphics and analytics software packages at IBCON 2013. Aplper’s company, BASSG ,is at the intersection of Building Automation Controls and Big Data. Thanks to Bryan Pike for chatting with us at IBcon 2013. Bryan and his company AIC Wireless are leaders in wireless controls, sensors, and the coolest lighting control ever the “Bulit”. Want to know how to set up a Sedona wireless network click here and check out Bryan’s training video posted on Controltrends. Thanks to Rob Murchison from Intelligent Buildings for stopping by and talking to us at IBCON 2013. Savvy real estate professionals know that Rob is the “go to guy” when they need to adopt and implement a comprehensive energy management and building controls strategy. George Hawkinson, Lynxspring’s Director of Marketing, explains how LynxCyberPro will secure your network by hardening your firewall and removing network devices from the public IP. No exposed IP devices, no exposed ports, and no need for a VPN. Dave Lorenzini, Google Glass. 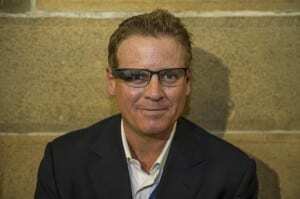 The “Welcome to a World Through Glass” served as an appropriate future-now primer for the Realcomm general assembly, as did the fascinating aerial view of a city’s Real Estate status, which left little doubt that Google Glass will be soon augmenting and shaping our view of the world.